Have a gym subscription but not the motivation? Then, the Pilates reformer exercises are best for you as they give better and fast results with minimum effort. These exercises are done lying down on a sliding bed-like structure and include body movements that work the muscles without you having to huff and puff like you would on doing regular cardio or weight lifting exercises. Guaranteed, you will enjoy doing Pilates reformer exercises. And your body will become slender, strong, and flexible in just a few weeks’ time. Are you ready to experience your body changing for the better? 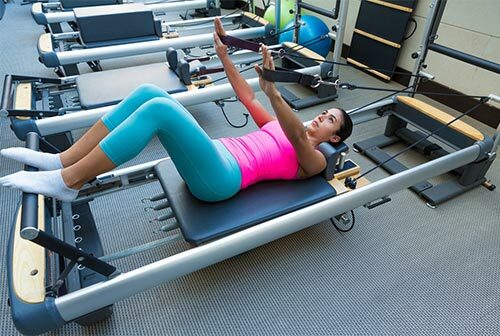 Read on to know the 10 best Pilates reformer exercises and their benefits. Swipe up! 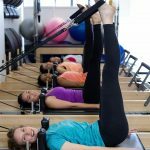 Pilates Reformer – What Is It And How To Use? 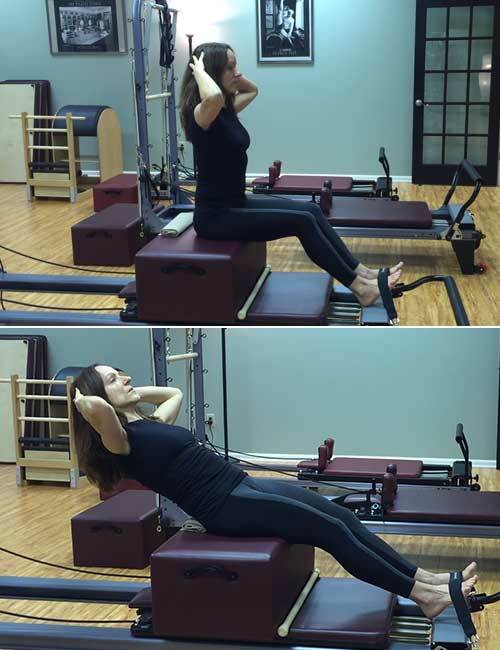 Pilates reformer is basically a popular Pilates exercise equipment. Pilates was invented by Joseph Pilates, a US Navy SEAL, and was initially used to rehabilitate injured soldiers in the war. The pilates reformer exercise equipment has a flat platform that can slide back and forth. This platform is attached to a spring that provides different levels of resistance. The platform has shoulder blocks that prevent you from sliding off it. At the end of the platform spring is an adjustable bar called the footbar. The footbar can be used with the feet or hands to move your body back and forth by a pushing or pulling action. The Pilates reformer can be used lying, sitting, and standing by pulling and pushing the footbar. You can do a variety of exercises targeting various problem areas of your body. If you want a fit and toned body, here are 10 Pilates reformer body workouts for beginners. Take a look. Adductors, glutes, quads, hamstrings, calves, and abs. Attach 2-3 springs to the platform for the required resistance. Lie down on the Pilates reformer platform. Put your toes on the footbar, lift your heels, and open your knees slightly. Place your hands by your side, palms flat on the platform, and stack your shoulders against the shoulder blocks. Look up. Press the platform and push your body up by straightening the knees. Hold this pose for a moment. Push your feet against the foot bar, bend your knees, and slowly get back to the starting position. Abs, pelvis, adductors, glutes, quads, hamstrings, and calves. Attach 2 springs to the platform for the required resistance. Hook the extension straps to the other end of the footbar. Lie down on the platform with your knees bent, and feet pointed. Lift the straps over your head and then slide in one foot after another to secure your feet in the loop. Press your pelvis down, place your hands by your side, and palms flat on the platform, and push your body so that you slide up. Extend your legs completely so that your legs are at 60 degrees with the platform. Keep your toes pointed. Make sure the straps fall between your knees. Start moving your legs in small outward circles. After completing 5 reps, circle your legs in the opposite direction. Adductors, abs, hamstrings, pelvis, and back. 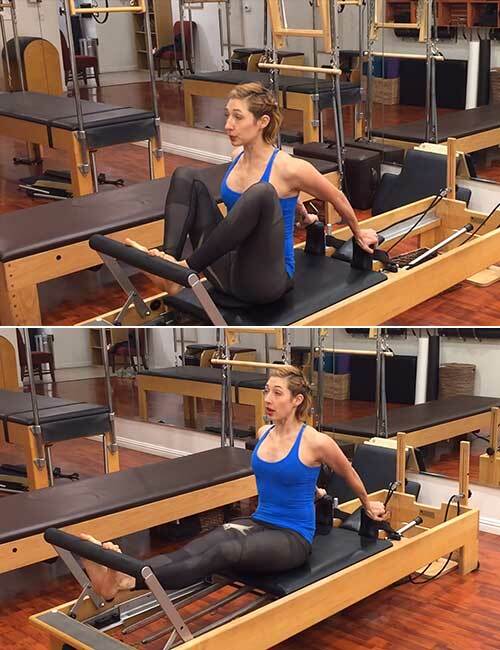 Attach the straps to the reformer and add two springs for resistance. Lie down on the platform with your knees bent. Pick the straps over your head and slip a foot into each strap loop, one after another. Make sure the straps are between your knees, knees are shoulder-width apart, and the entire back is against the platform. Place your hands by your side. Push your body and straighten your legs. As you do, you will slide up. Pull your legs back to the starting position and slide down a little as you do so. Lower abs, pelvis, glutes, adductors, quads, and hamstrings. Sit on the Pilates reformer platform. Place your toes on the foot bar, and knees shoulder-width apart, and hold the edge of the platform so that your body remains stable. Curve your back and tuck your neck in. This is the starting position. Inhale, engage your abs, and extend your legs. You will slide back as you do so. Exhale and bend your knees again. Come back to the starting position. Set three springs for the resistance. 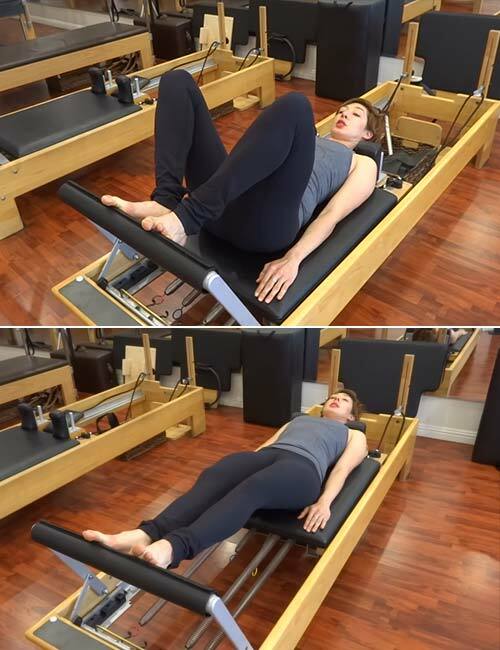 Sit on the Pilates reformer platform, place your toes on the footbar, lift your heels, and hold the shoulder blocks behind you. Extend your legs and slide back. Lower your heels. Again, bend your knees and slide forward. Lift your heels. 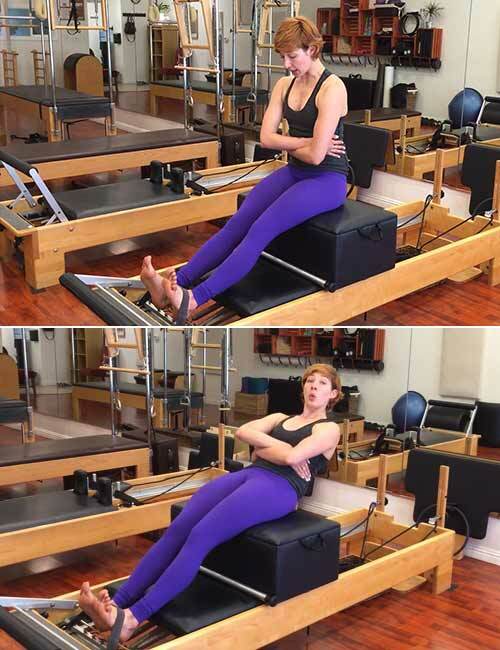 A short box is an extra attachment for the reformer. Place it over the shoulder block. If you are petite, place the short box in front of the shoulder block. Attach two heavy springs and secure your feet by sliding your feet under the resistance loop attached to the foot bar. Press your feet wide so that they are hip-width apart. Wrap your arms around your waist and curl your tailbone toward your heels and lean back. Hold this pose for a moment and then round back up. Sit on the short box and secure your feet on the footbar by sliding them through the strap attached to the footbar. Place your hands on the back of your head. Keep your back straight. Slowly lean back until your tailbone is in line with your heels. Get back up to the sitting position. Abs, glutes, hamstrings, calves, and quads. Stand on the Pilates reformer platform. Put your heels against the shoulder blocks. Bend and hold the footbar with your hands. Your hands should be shoulder-width apart. Inhale and arch your spine. Drop your head down and look at your navel. Squeeze your glutes, engage your abs, exhale, and push the platform back. Inhale and slide the platform forward to the starting position. Keep your back arched. Knee joint, hamstrings, quad, calves, and abs. 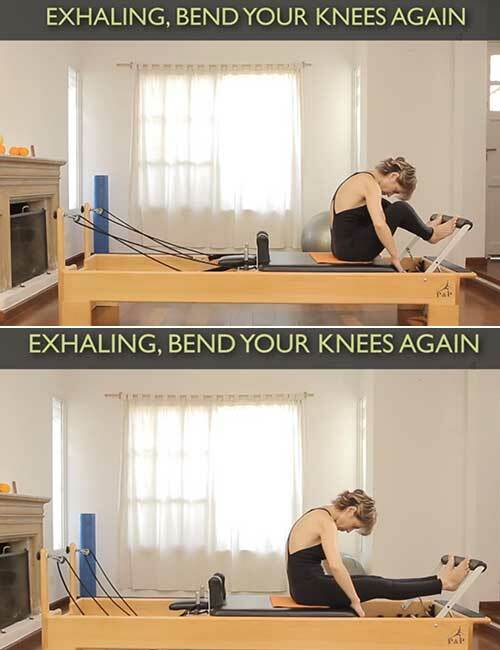 Kneel down on the Pilates reformer platform. Come up on your knees and place your hands on the footbar. Make sure your hands are shoulder-width apart. Place the soles of your feet against the shoulder blocks, and your legs hip-width apart. Sit back on your heels and curl your spine. Keep your shoulders relaxed. Bend your neck so that your ears are between the elbows. Make sure you do not over curl your back. Exhale and contract the abdomen. This is the starting position. Inhale, lift your buttocks a little, and press out the platform so that it slides back. Again, exhale, contract your abdomen, and press back in so that the platform slides to the starting position. Lie down on the Pilates reformer platform. Place your toes on the footbar, your hands by your side, and palms flat on the platform. Extend your legs and slide up. Drop your right heel down, bend your left knee, and slide down. Slide back up by extending your left leg and raising your right heel. Drop your left heel down, bend your right knee, and slide down. Slide back up by extending your right leg and raising your left heel. These 10 Pilates reformer exercises are really fun and easy. They are also effective and will help you shed the pounds quickly. Plus, there are other benefits. What are they? Find out in the next section. Helps strengthen the core muscles. Helps improve overall posture of your body. Helps relieve joint pain and muscle pull. It is clear that Pilates reformer workouts will help you get a toned, strong, and flexible body if you practice them regularly. But you may not see any results if you do the exercises wrong. Here are a few common mistakes that you must avoid. Not breathing in and out – Make sure you exhale and inhale while doing the exercises to get results. Moving too quickly – You must move slowly and make sure you are engaging your muscles so that your Pilates session is most effective. Doing more number of reps is not what you should focus on. Do the exercises with precision. Not focusing on the movements – Focus on the movements of every body part. This will engage the right muscles and help you benefit from Pilates sessions. Now, the main question is, how many calories can you burn by doing Pilates reformer exercises? Scroll down to find out. You can burn anywhere between 250-450 calories in one session of Pilates reformer exercise. If you do it for 4 days a week, you will burn about 1000-1800 calories per week! However, the calories burned will also depend on your exercise levels, body weight, and time. To conclude, Pilates reformer exercises are an amazing way to shed pounds quickly without feeling like you are exercising at all. This fun equipment will keep you motivated to attend your Pilates sessions regularly. Apart from getting a fit and toned body, you will also reap immense mental health benefits. So, go ahead and join a Pilates reformer class today. Take care! 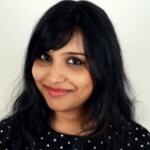 Yoga Vs. Pilates – What’s Your Choice?